What good is this...? Where are the rest of the mystery series? I’d like to see them in the order of the series, so I don't miss one. Grouping by some time of year is rather odd. I had to go look up hallmark movies on wikepedia to figure out which ones I watched already. Even the links to the movie trailers are cryptic and not useful. Hard enough getting the accurate info to show up on tivo each week. Missed the premieres for everything this season because of it. Canceling cable soon anyway. I downloaded app which I love but I made the error of adding to my calendar. Now I have everything listed and I can’t remove it without going in and deleting each one on its own. So now you remove all the movies with Lori Loughlin. Really Hallmark?? I get you’re disgusted with the whole debacle over Lori but I would really like to keep track of the movies I saw even if it had her in it. Beyond ridiculous!!!! I’ve been using the app since the 2018 Christmas season and find it very useful. I love that it always tells me when a particular movie will be on next, so even if I miss a showing, I know when to look for it next. That’s been so helpful! I like that updates have included movies from past themed events, so I know when old favorites are on, too. I wish the app allowed us to rate movies. When you crank out multiple new movies a week, some are stronger than others. I would love to send Crown Media some feedback! For next Christmas, it would be great to have three lists: Hallmark Channel, Hallmark Movies & Mysteries, and one combined list. When movies are on both channels on the same night at the same time, we need a combined list to help choose. Since there are SO MANY Christmas movies, you might need a fourth list for returning favorites so we can keep them straight. 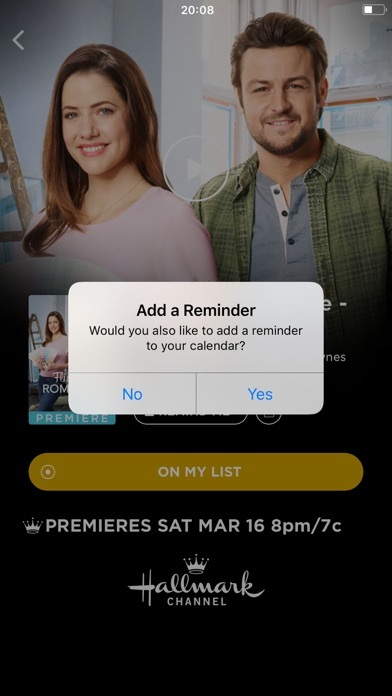 Great app for keeping track of the movies you’ve watched, but I wish it had more hallmark movies through the years checking off all that i have seen. Maybe with year tabs in the seasons or just year tabs to get to the season tabs. I also wish each movie in the lists had the description of the movie so I knew if I wanted to watch it without having to look it up. I love this app to help me keep track of the movies. But I have had issues with it glitching: showing movies twice on a list, messing up and shutting down when I switch from one list to the next. I would like to see the app notify you when movies are added to lists though. Hope the new update corrects glitches! Love to track the movies but the quirks are winning. I started with the Countdown to Christmas app on my iPad. An update changed it to the Everywhere app, which gets hung, so I close and reopen almost every time I use it. Set up the reminders, thinking it would create the calendar it gave as a choice. Now I can only turn the reminders on or off but can’t change the calendar. I downloaded the app from the cloud to my iPhone to see if it would work better on a different device—none of the movies were marked as Watched or Want to watch, so I didn’t bother using it. Back to the iPad. I noticed the new movies aren’t listed. Headed to the App Store to find I needed to download the Checklist. Can’t find Love Under the Rainbow on any of the multiple lists. The checklist is a great idea. Maybe a future update can have a sort by title option. Thanks! I was very excited when this app came out in time for Countdown to Christmas. I was even more excited you expanded it to include Winterfest, Countdown to Valentines Day and Hallmark Movies and Mysteries. I enjoy these lists including the preview, when it’s playing and if you missed it, when it’s playing next. Spring Fever is next and I’m hoping we will have a new list for it and all the other movies going forward. “Love Under the Rainbow” isn’t on any list so far so I’m hoping it will get added to one. To really make this app even better, I think we should be able to keep track of our own reviews of the movie. For the last several years, I have kept a running list of every single Hallmark movie I have ever watched. I have it divided out by the year it was released, the title and my rating. I intend to watch every one of them ever made. I think it is fun and challenging to check a new one off the list in the app. I hope one day this app will list all of your movies ever made and we can check it off and review it. When that happens my rating will change from 4 to 5. As soon as you start showing commercials for new movies, and/or your preview shows, the app should also be immediately updated to list those movies. I love this app, but it’s become kind of pointless now since they haven’t updated it to include any of the new spring movies or mysteries. This app doesn’t update. I don’t need to see the Christmas ones in March I want to know what’s coming for spring. It’s not user friendly. Please update before the new movies come out! We are missing the spring list and they started today, and some of the mysteries. Also, please add release date for the movies. Especially Aurora and series movies we may not remember the names. Can’t wait to see how the app evolves and improves. This app was a Christmas Miracle! Why have you stopped updating abruptly? I enjoy this app, checking off the movies I have seen. However the checklist has stopped after the Valentine’s movie. Would love it to add all the new movies in March. I don’t want to miss any movie. I thoroughly love the app. I just wish it would update since there are new movies coming out on Saturdays. The other thing I wish is that it would include older movies since so many movies are similar so that it is easy to know which movies I have seen. I stupidly agreed to sync the movies to my calendar and so disappointed that I can’t fix it. I deleted the app but movies are still there. So I had to delete them one by one. Love the channel but not this app. Once you download there is not a settings tab to unsubscribe or change preferences. The movies will show up in your calendar and you have to delete one by one. I would rate higher if all movies were listed. Disappointing that only a handful are listed for each category. Suggest to list all and maybe create a “new category” for the most recent releases. I love this app. I only have one suggestion. I would like for there to be numbers appear on the app icon, similar to new emails that haven't been read. Otherwise, great app! Love this app so much!! It is great to be able to track all of the Hallmark movies that I watch. But it would be nice to rate the movies, so Hallmark can get an idea of which movies we love and love less. Also, for our own records. Also, quite a few movies are missing from the Hallmark Mysteries & Movies checklist. May be better to separate the movies by series. I love this app. It’s easy to use but would love updates every time new movies are shown throughout the seasons! I really love this app. I appreciate the calendar reminders; I like checking them off as completed. However, I would like to see the Movies & Mysteries Channel have different pages for their different series. For example, Aurora Teagarden, Garage Sale Mystery’s, etc. I try to follow and watch these series. Sometimes, I don’t know if I have seen them all or not. Keep making GREAT movies! I just want to know when will the valentine's list come out? It’s wonderful to track which themed movies you’ve seen. But what about the rest of them? It would also be awesome to rate the movies in the app, or to be able to keep track of the ones you loved verses liked or hated completely. For themed viewing, it’s alright. I’m chiming in about adding prior year movies. They did that in a limited way with the Winterfest movies but still only included last year and this year. Also, include a way to not just say watched but also rate. It will make it easier to keep track of if a movie is worth a re-watch. This app is a game changer for my Friday & Saturday Nights. Who would have imagined that this would change the scene of your entire home? I am really liking this app so far especially that I can link my calendar and get notifications of the movies and being able to know which ones I’ve watched and the ones that I want to watch. My question is when will the countdown to valentine movies be on??? I haven’t found a way to add only new movie premieres to my ‘Want to Watch’ list. It’s given me EVERYTHING, even movies I’ve seen 2-3 years ago! 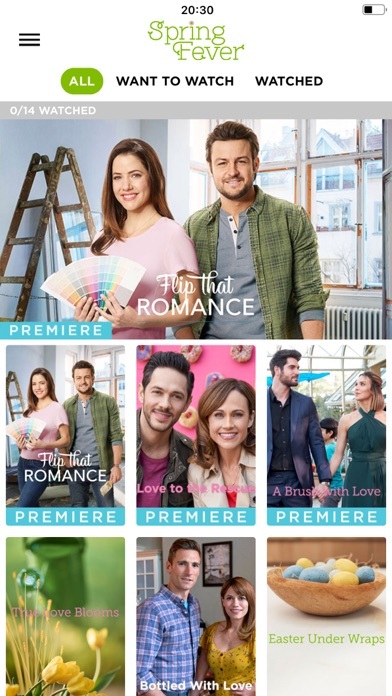 As an avid Hallmark Movie watcher I usually almost always watch new ones as soon as they’re broadcast and am anxiously waiting for the next release. I enjoyed using this app during Xmas. Very useful because they were all NEW releases. And though I now see the app have the new releases labeled ‘Premiere’ and they’re at the top of the list, I still don’t want to have all HM & HMM being broadcast showing. Ive had as many as 90+ in my count Jan thru Feb. That’s crazy! I wish they’d add an option to select ‘Premieres Only’ to show on your ‘To Be Watched’ List. Helpful, but needs more info. There’s no option to submit feedback in the app itself. Each movie should include a short summary & year of release instead of redirecting to the appropriate Hallmark movie page on their site. The Mystery list does not include the Fixer Upper, Flower Shop, and several other mystery series made for Hallmark. 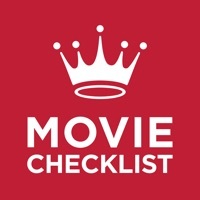 The app is great to check off movies you’ve seen and find out about movies you’ve missed. The Christmas list of movies for both Hallmark and Hallmark Movies & Mysteries is great and includes all movies from 2018 but what about adding previous years Christmas movies. 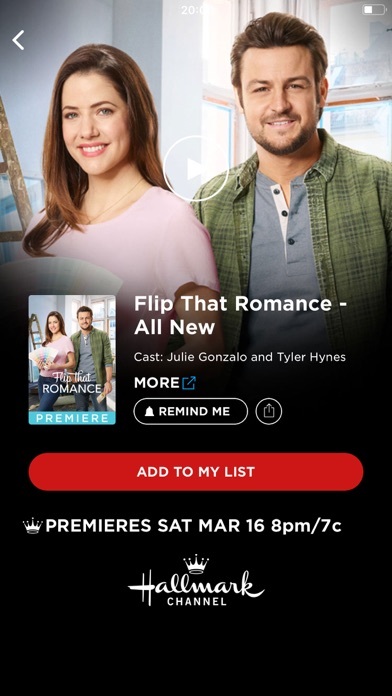 Also, the app was recently updated with most of the mystery series (example - Garage Sale, Murder She Baked, Aurora Teagarden, Hailey Dean and the new series that start in 2019 but left off Flower Shop, Fixer Upper, Gourmet Detective and many others). Hopefully the app with be fixed and updated soon with all of the Mystery Series. I agree with all the improvements list by the previous reviewer. Love the channel(s) and movies! The app could be more user friendly! We are “just some island in the Pacific “ but Hawai’i has a time zone also. Please add it! I gave this app a try this Christmas. I used it to keep track of the movies I had watched so I could listen to the matching Deck The Hallmark podcast for those movies! Suggestion: add a way to track whether or not we liked the movie (a star? Top 5 or Top 10?). 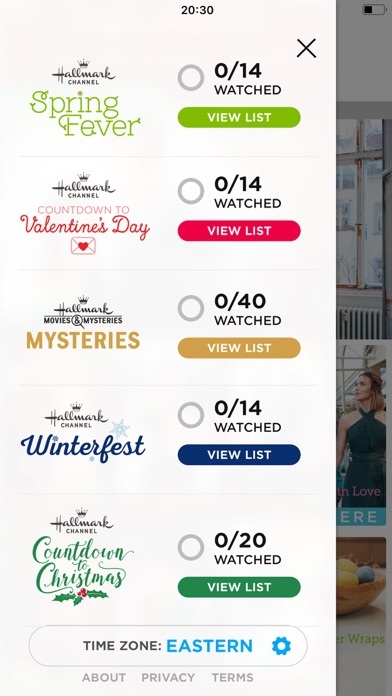 Seems like it could provide good data for Hallmark, and a fun way for viewers to remember which ones were favorites. The recent changes in the app have made things worse. Movie icons are doubled on the Mysteries page so that I see 78 movies instead of 39, and checking off a movie as already watched doesn’t work. The app can’t count. The app worked well during Christmas, but doesn’t work now. The newest version of this app has some bugs in it. *i have watched quite a few shows listed but as I mark them off, the watched shows became 0/37. It will not keep track correctly. *also, it was listing the movies on the channels twice. So, instead of there being 35 movies, there were actually 70 movies listed. *this app was working fine during the Christmas season but with the latest update and the new movies, it has started to glitch. Sad day because I can appreciate this apps purpose and would like to continue using it throughout the year but it is getting frustrating with the glitches. It was great when just Christmas movies were in the list. Now the Mystery movies have it all messed up. Duplicates films & wont accurately count which ones you've watched & what's left to watch. It's so frustrating I probably won't continue to use it! The fix installed today did nothing! The red dot won’t got away... And I mark as watched shows up in my watched section but it still says I have 0/39 shows to watch. I know, not a crisis, but it’s annoying. I’m showing a red notification on app but nothing shows when app is open. I checked the majority of the mystery movies as watched but the numbers keep changing Once it showed 0/79 then Earlier today it showed 0/34 Though I’ve watched 33/39 It now shows 0/39 even though I’ve marked the ones watched. Counts are not correct on mystery tab page where the 4 categories are listed nor on the Winterfest page where it says click list, please help. I don’t want to loose my Christmas counts as I’m still watching recorded shows. Anyone else have a “phantom” notification that won’t go away? !